I highly recommend this D.J. He is amazing! Kept the party going all night long, was perfectly timed with the music for all the special moments, the up lighting and dry ice was amazing and added the perfect touch. He was also very helpful with recommending timing for different aspects which was very appreciated. If you want a good party Hire Ryan. Ryan was great. He was funny, made our guests laugh quite a bit. I loved how he also got up on the dance floor when it got slow to try and get everyone up and dancing. Ryan was so awesome to have as our DJ. Though the planning process he was so easy to get a hold of whenever we had any questions. The night of the wedding was amazing, his lighting was beautiful and we even had a GOBO done which looked so great! He had the whole crowd dancing all night long, and it was so amazingly fun. Prices were very reasonable also. First off, Ryan was amazing! I would totally recommend him to anyone that is looking for a personable, reliable and fun DJ! We had hired him to do our Jack and Jill, he did a fabulous job helping raise money and even participated in our games as well! Everyone at our wedding said the DJ was incredible, he had all our guests up and dancing, they wanted to keep going all night long even after the music had stopped! He played a great selection of music from all different genres.We had purchased the ultimate package with up-lighting. The room with our décor looked stunning, we also had two big LCD screens for our slide show that played throughout dinner. We had asked him to be our MC, and did such a wonderful job and got the crowed pumped up for the night, he also helped all our other vendors/events run smoothly throughout the night as well! Thank you so much Ryan, you were wonderful and your professionalism and expertise were the best! Our family is STILL talking about how awesome the music was at our wedding! Ryan went above and beyond to make an amazing list. He even gave my husband the mic so he could sing a song to me! We had an absolute blast and hurt for days after from dancing! Ryan spent time with us leading up to the event discussing what we wanted and making sure to offer suggestions when we weren't sure about something. 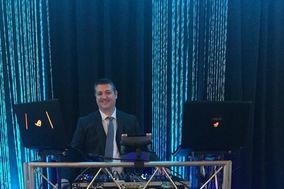 He was our DJ for both the ceremony and reception and we are so pleased! We had a blast, everyone was dancing all night long and throughout the reception there was a seamless flow of events. Thank you! Amazing job, played all the right music and really kept my guests dancing all night! Was a perfect 'master of ceremonies' as well and did a great job introducing us and everyone for speeches etc. We had a great party thanks to Ryan! People are still telling me that our wedding was the most fun they had at a wedding :) The games he played were a lot of fun. Our guests really had a laughing, good time. Ryan was also a fantastic MC. He even got everyone's name pronounced right...and there were some toungue twisting names! He's very easy-going and had no problem taking requests from our guests. Thank you very much, Ryan!